Celebrate Lent, Holy Week and Easter with 18 specially selected Spanish songs from Father Carmelo Erdozáin. 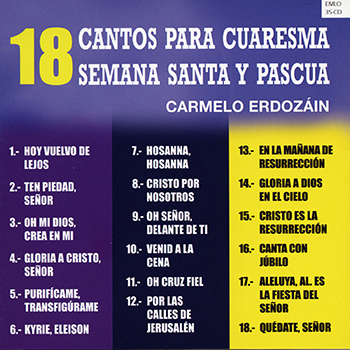 Recorded in Spain, 18 Cantos para Cuaresma Semana Santa y Pascua from Father Carmelo Erdozáin brings together Spanish songs for Lent, Holy Week and Easter—six songs for each seasonal period. The songs on this compilation album were specially selected for lyrics that reflect the richness of the Lenten and Easter Scriptures as well as their solemn and festive melodies. Favorites include "Hoy Vuelvo de Lejos," based on the parable of the prodigal son, and "En la Mañana de Resurrección," drawn from the rich images of the Easter Sequence. On the whole, this collection draws its listeners deeper into experiencing these holy seasons, from preparing hearts in the time of Lent and journeying through the Lord's Passion during Holy Week to celebrating his resurrection throughout Easter. Accompaniment parts for some of the songs can be purchased individually on ocp.org.